Twice as large as all of the other major Hawaiian Islands combined, the Big Island is also the youngest of the island chain. At some 800,000 years of age, it's also still growing. The Hawaii Volcanoes National Park contains one of the world's most active volcanoes which continues to pour into the sea adding to the shoreline. From its snow capped peaks to its black, white and green sand beaches the island is really a study in contrasts. Rocky deserts and lush rainforests. Peaceful bays and rolling pasture land. Luxurious orchids and waterfalls on the windward side, and areas on the western slopes where the world famous Kona coffee is grown. The Big Island is the place for adventure. Horseback riding in Waimea. Golf everywhere. Snow skiing (really!) at Mauna Kea. The ocean is gorgeous at any time of year. Kona is the marlin fishing capital of the Pacific. Or maybe the quaint shops and restaurants of Hilo, will be enough to keep you thoroughly entertained. The Big Island is also the place for history. All over the island you'll see petroglyphs, and heiau, ancient places of worship. The royal summer palace and the first Christian church in Hawaii will take you back in time. From the rainbows and waterfalls of the windward side to the sun drenched beaches of the Kona/Kohala Coast, the Big Island is vibrant and alive. And wherever you go, you'll find the spirit of Aloha. Of course, you'll find all of the amenities, attractions, activities, and accommodations that will fit any pocketbook and life style. You'll also find a physical beauty, a depth of cultural heritage, and a spiritual warmth that is without equal. Whatever you're looking for in a Hawaiian vacation, the Big Island offers some great moments that could last a lifetime. Because Hawaiian weather varies very little throughout the year, the weather you'll experience on the Big Island depends more on location than time of year. The wide variety of climates and the resulting range of temperatures and rainfall across the island are due primarily to differences in elevation and exposure to the moist northeasterly trade winds. The average day-time temperature in the coastal resort areas ranges from the mid 80's (29.4 C)in the summer months of May to October to the mid to low 70's (23.9-26.1 C) during the winter months of November to April. Valid for select travel through 12/13/19. Rate is per person, land only, based on double occupancy for check-in on 6/3/19, in room categories shown. Unless otherwise indicated: rates quoted are accurate at time of publication, & are per person, based on double occupancy. Airfare, taxes, surcharges, gratuities, transfers & excursions are additional. Advertised rates do not include any applicable daily resort or facility fees payable directly to the hotel at check-out; such fee amounts will be advised at the time of booking. Rates, terms, conditions, availability, itinerary, government taxes, surcharges, deposit, payment, cancellation terms/conditions & policies subject to change without notice at any time. Other restrictions may apply, including, but not limited to baggage limitations & fees, standby policies & fees, non-refundable tickets & change fees with pre-flight notification deadlines, & blackout dates. Fees & policies vary among airlines. Contact travel advisor for any details or questions. Not responsible for errors or omissions. Pleasant Holidays acts only as an agent for cruise & tour providers listed. CST# 1007939-10. Copyright©2019 Pleasant Holidays, LLC. All Rights Reserved. 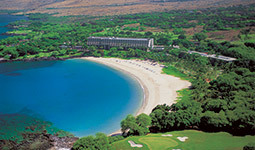 Founded in 1965 by Laurance S. Rockefeller, the Mauna Kea Beach Hotel is a landmark of luxury on the Island of Hawaii's golden Kohala Coast. Situated on Kauna’oa Bay, a beautiful white-sand crescent beach, the Mauna Kea offers 252 luxury guestrooms and suites with breathtaking ocean views, championship golf, exceptional dining, 11-court Seaside Tennis Club, spa services, and much more.